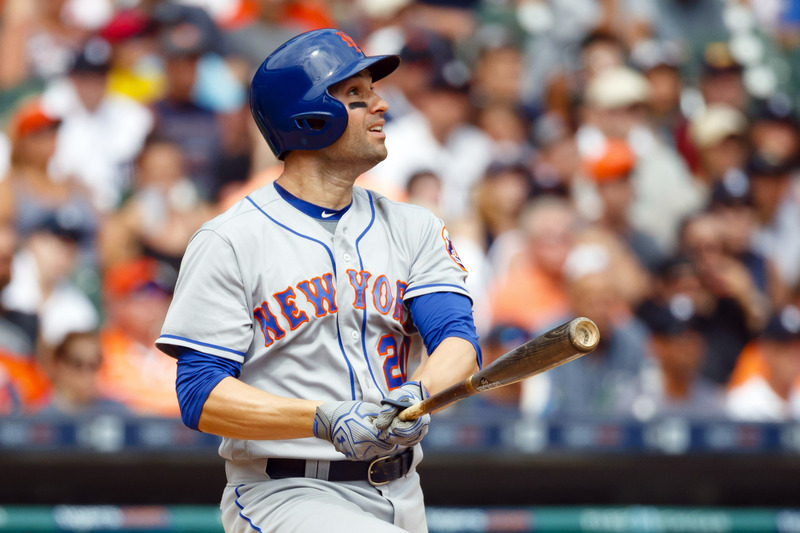 Jacob deGrom does his part and Neil Walker seals the Mets win for the second Sunday in a row as he blasts a ninth-inning home run off of K-Rod. Every statistic besides the number of runs scored indicates that the Tigers should have won this game. They had 11 hits, to the Mets’ five; three walks, to the Mets’ none; no errors, to the Mets’ two; and 12 total bases, to the Mets’ 11. They went 3-for-8 with runners in scoring position, while no Met batter even batted with a runner on second or third base. But the Mets beat the Tigers in home runs and, of course, runs, and those would make the difference on Sunday. The Mets went down 1-2-3 in the top of the first inning, and would do little of interest at the plate against Anibal Sanchez until the seventh. Curtis Granderson would bloop a two-out single here (in the third) or Kelly Johnson would line a two-out single there (in the fifth), but Sanchez would easily make his way out of the inning each time. Sanchez struck out 10 Mets over the course of the game — punching out every Met except for Michael Conforto and Alejandro De Aza either once or twice. Sanchez cruised through eight innings on just 100 pitches, tossing 70 strikes. Despite a Johnson fielding error, deGrom only needed 11 pitches to get through the first inning after inducing Miguel Cabrera into a double play two pitches later. For each of the next three innings, though, the Tigers would give deGrom trouble, forcing him to throw 58 pitches in the second, third and fourth combined. The situation seemed precarious in the top of the fourth inning, when Victor and JD Martinez knocked singles after eight and seven-pitch at-bats, respectively. But deGrom battled out of trouble with by striking out Justin Upton and inducing a double play from Casey McGehee. deGrom put down the next six batters in order. Sanchez was still rolling at this time, too, and retired Jay Bruce on a weak popup and James Loney on a strikeout in the top of the seventh, seemingly on his way to another single-digit pitch inning. However, he left a 2-1 fastball up, one of his few mistakes of the game, and Conforto hammered it to left for the first run of the game to give the Mets a 1-0 lead. The Tigers answered right back. deGrom was visibly tired by this time, his fastballs hanging around 92 instead of their usual 94-95. He got a quick out on his first pitch of the inning, but allowed a single to Upton on the second. McGehee lofted a changeup nearly over the fence for a go-ahead home run, but Granderson hauled it in on the warning track. deGrom walked 60 OPS+ and .237 TAv-carrying James McCann to put runners on first and second. Andrew Romine squibbed a ball that died in the grass in front of third base, loading the bases with two outs. Terry Collins removed deGrom, who had just thrown his 103rd pitch, bringing in Jerry Blevins to face the lefty-hitting Tyler Collins. But Brad Ausmus reciprocated by pinch hitting righty-hitting Ian Kinsler. Blevins still has a .133/.250/.233 line (albeit in just 37 PAs) against righties this season, but those righties don’t walk up to the plate with a .297 TAv the way Ian Kinsler does. Kinsler chopped another infield single over Blevins’s head that Walker had no play on, tying the game at one. Addison Reed came on to finish off Jose Iglesias with a nice snag by Granderson to get the Mets out of the inning, but the damage was done. That put the Mets’ fifth baserunner of the day on base. Walker then came up and, after a fastball in the dirt, promptly parked the second pitch into the right field stands to give the Mets the 3-1 lead, a lead they would never relinquish. Ian Kinsler hit a two-out single, but Jeurys Familia struck out his third batter of the inning shortly after to stave off the series sweep for the Mets. -Kinsler’s RBI single snapped deGrom’s 20-inning scoreless streak, which was the longest of his career. -After a night off, the Mets will come home for a series against the Diamondbacks starting Tuesday. Steven Matz will go against Zack Greinke.